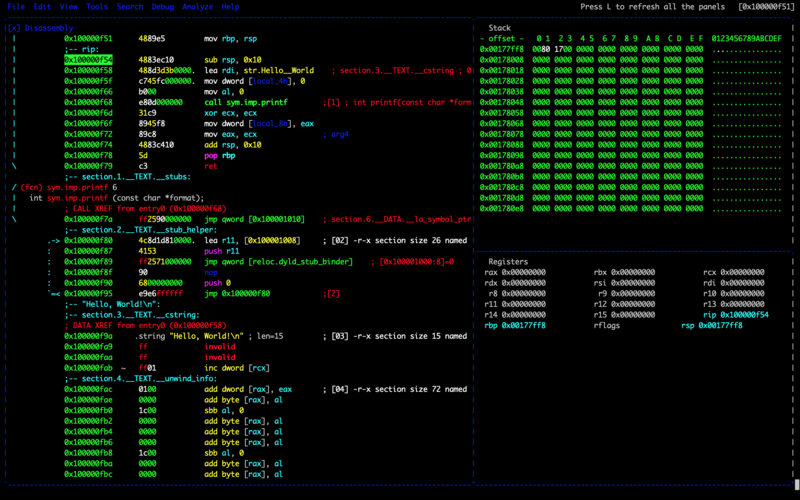 I would like to use Radare2 to learn about how C is assembled into assembly but I am having trouble with the layout. I think the V! mode would be very handy as you can watch the registers update as the instruction pointer moves through the program, but I don't understand the layout. It seems when I add a window (like Stack or Registers in this photo) it appears offscreen and I have to try closing different and splitting windows until the layout kind of falls into place. Is there an easy way to change exactly what is in each window? I know "X" closes a window, "z" switches the current window to the front, and "-" / "|" split a window. I have tried looking at the help but can't seem to figure out any other commands related to this issue. Use TAB to move between the windows, use e to change name and command of a specific panel you are on. Use w to enter the window mode. "Window mode" allows you to control how the panels look like. In window-mode you can use HJKL to resize the window's height and width. Not the answer you're looking for? Browse other questions tagged x86 radare2 static-analysis or ask your own question. What is an effective way to debug a 32 bits application within a 64 bits OS? Is it possible to (heuristic) identify the begin addr of main function in a stripped ELF?